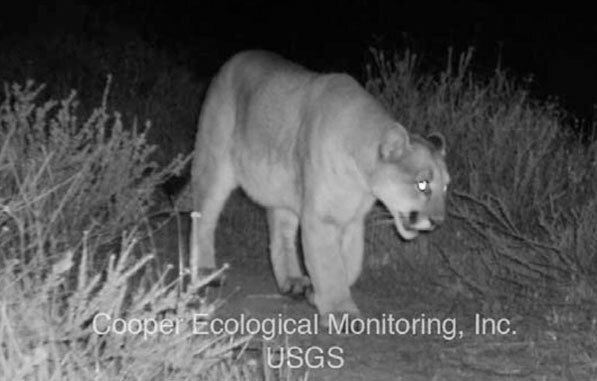 It happened on February 12, 2012 at 9:15 p.m. Cameras belonging to the Griffith Park Natural History Survey’s (GPNHS) Wildlife Connectivity Study captured a mountain lion moving east towards Griffith Park. They are the first known photographs of a mountain lion east of the CA-101 Hollywood Freeway/Cahuenga Pass within the Santa Monica Mountains eco-region. The GPNHS Griffith Park Wildlife Connectivity Study is the first project to evaluate the movement of wide-ranging mammals through potential corridors that may connect Griffith Park and its vicinity to neighboring natural areas. Mountain Lion P22 is an important find. Compared to smaller Griffith Park carnivores like bobcats and coyotes, mountain lions require more space and connectivity. Populations are known to exist in the Santa Monica Mountains west of and in the Verdugo Mountains north of Griffith Park. Preliminary genetic analysis by UCLA indicates that P22 is likely from the Santa Monica Mountains, which would mean he crossed both the 405 and the 101 Freeways. The presence of this solitary, territorial animal is a positive indication that Griffith Park is more connected to nearby open space than once thought. Currently, GPNHS researchers are using thirteen remote cameras at potential wildlife corridors across the Hollywood Freeway/ Cahuenga Pass area which divides Griffith Park and contiguous wildlife habitat from the rest of the Santa Monica Mountains. Cameras are located both on potential wildlife corridors to document wildlife crossings, as well as in open space adjacent to potential corridors to monitor wildlife activity on the edges. This work is critical. Highways and freeways may speed human travel, but mortality caused by collisions with vehicles is one of the most well-known and immediate risks to urban wildlife. When wildlife is unable to successfully cross urban arteries, inbreeding and loss of genetic diversity can result. This may elevate an animal population’s chance of extinction. Initiated in July 2011, the Griffith Park WIldlife Connectivity Study has recorded to date mountain lion (Puma concolor), bobcat (Lynx rufus), coyote (Canis latrans), mule deer (Odocoileus hemionus), raccoon (Procyon lotor), and striped skunk (Mephitis mephitis), among others. In the near future, camera stations will be added on the east side of Griffith Park to monitor potential connections for wildlife across Interstate-5 towards the Verdugo Mountains. We hope that information from this study will be used to identify valuable wildlife corridors and to inform stakeholders on how to better facilitate wildlife movement to and from Griffith Park. The GPNHS Wildlife Connectivity Study documented Mountain Lion P22, but CA Fish & Game and the National Park Service made the decision to radio-collar and release it back into the Griffith Park area. Wildlife experts maintain that humans have little chance of being killed by mountain lions. They have been studied in areas with heavy human use and have been able to coexist without incident. These elusive creatures are primarily active at night and usually hide out in shady places during the day. A study in Anza Borrego State Park tracked mountain lions in an area that supports human recreation. The animals were resting right alongside trails and went unnoticed and unencountered. Attacks are rare and those recorded have almost all been by young juveniles struggling to find natural prey in marginal habitat. By way of contrast, P22 is a 3 year old, full grown male and a successful deer specialist. It is not acting abnormally or dangerously and has already crossed paths with and been sighted by humans in the park without incident. 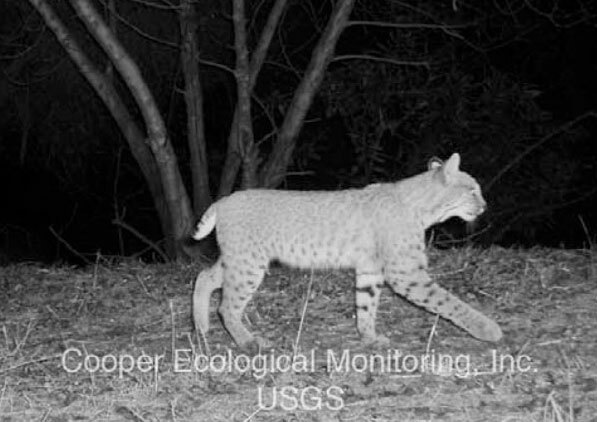 Images show the dramatic difference in size between mountain lions and bobcats. Both are shy and elusive, but observers are many times more likely to encounter a bobcat than a mountain lion in Griffith Park. Due to their high resource demands and reliance on contiguous habitat, these large and medium sized mammals are excellent indicators of ecosystem health and connectivity. Findings from the GPNHS study can raise awareness about how important this is to the survival of natural creatures in the wild. Research for this Griffith Park Natural History Survey project is taking place in cooperation with landowners in the area. It is being jointly conducted by biologists Dan Cooper and Miguel Ordeñana from Cooper Ecological Monitoring, Inc. and Erin Boydston of the USGS Western Ecological Research Center. Principal funding is provided by Friends of Griffith Park and its members, with additional support from Hollywood United Neighborhood Council. Additional project support comes from the U.S. Geological Survey. Community partners include the City of Los Angeles Department of Recreation and Parks, Los Angeles Department of Water and Power, Los Angeles Philharmonic, Caltrans, Mountains Recreation Conservation Authority, as well as private residents in the area. These observations are considered preliminary and have not been interpreted; complete findings from the study will be released following analysis and project completion in late 2013. Avoid hiking when mountain lions are most active – dawn, dusk, and at night. Stick to wide, established trails. noise and try to look bigger by waving your arms; throw rocks or other objects. I think I saw P-22 this AM on the ridge above Glen Oak walking up the hill. Is there any way I can know for sure? He’s been going out on the streets from time to time, Beachwood, Oaks and Los Feliz. If you saw a very visible collar on his neck, likely it was P-22. NPS usually doesn’t confirm whereabouts, though. Thanks for the info, though.